Rihanna loves Jason of Beverly Hills! The jeweller is her go-to for extraordinary diamond pieces. 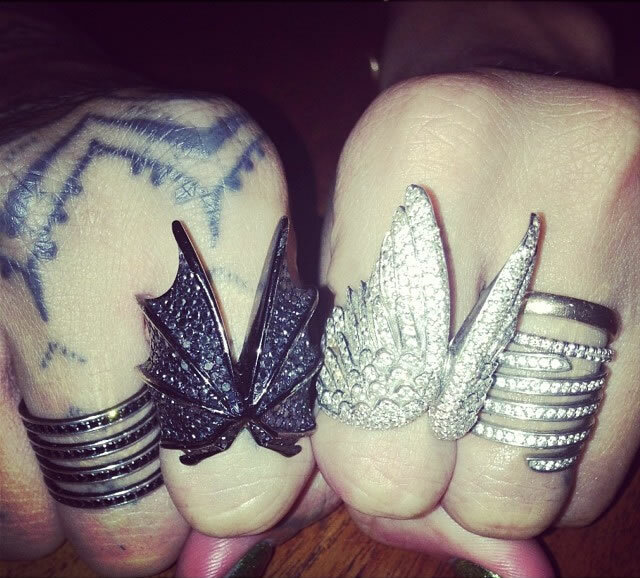 Back in September 2012 she wore his Double Angel Wing in white gold and she’s now acquired his black gold and black diamond Bat Wing ring. Visit Jason’s website for more info on these beauties. Rihanna is also wearing two of Lynn Ban‘s pavé diamond serpent coil rings, which are staples among her accessories. Click here to visit Lynn’s website, which finally has an online store.